The soaring peaks and deep hollows of Avery and Watauga counties ring with cold in winter—the air pure and sharp. Now that autumn’s blazing glory has faded and fallen, what remains is a world of subtle shades: the tawny browns and delicate grays of boulders and bare branches, the shifting blues of shadow and snow. There’s even green near the forest floor—unexpected bursts of color from ferns and mosses, ground-hugging wildflowers, native evergreen rhododendrons, and gnarled conifers. Sure, there’s skiing in the High Country, but there’s so much more for outdoor lovers. Try horseback riding with a prize-winning cowboy poet, barreling down a mountainside on an inner tube, flying high on a zipline, hiking at Grandfather Mountain without the crowds, or taking a figure skating lesson. I experienced all that firsthand when I lived in Boone for 25 years. After moving to comparably balmy Asheville five years ago, I realized that winter here just isn’t the same. So I returned to the High Country as a tourist rather than a resident, cramming half a dozen terrific outdoor activities into an extended weekend. Over the course of three pleasantly cold and slightly damp days, I received a warm welcome and a reminder of all my former stomping ground has to offer. There’s nothing like a handsome cowboy and some sure-footed ponies to get the blood moving on a frosty morning. Keith Ward, a Watauga County native and repeat prizewinner at the National Cowboy Poetry Rodeo, owns a beautiful and rugged expanse of land surrounding the Dutch Creek Trails barn, a stone’s throw from Valle Crucis proper. There his staff provides winter trail rides, while Ward regales visitors with recitations of tuneful cowboy poems—the kind you’d hear sitting by a campfire after a tough day of driving cattle. Trails climb and cross the mountains that serve as a backdrop for the horse barn. With the leaves stripped from the trees, the view goes on forever, rolling silver-grey and pink, fading to blue. Trail rides generally last about an hour, and depart in all weather, except severe wind chill conditions or when the trails have ice. Check the website for current conditions or call ahead. Routes traverse open fields and forests, and when the clouds part, you’re likely to glimpse the distinctive profile of Grandfather Mountain. Years ago, skiing was king at Hawksnest Resort, with a few short but enjoyable slopes in the hamlet of Seven Devils. The scene has changed from a traditional ski resort to winter fun central, offering 20 tubing lanes with conveyor lifts and a huge network of ziplines. The cables zig and zag over a tumbling creek and through the woods, sometimes at heights of 200 feet. The collection of nearly 20 ziplines, a few of them more than 1,500 feet long, carry adventurous types ages five and older at speeds approaching 50 miles per hour in sections. If you plan your trip just right or get lucky, you can zoom through a flurry of snowflakes. Several resorts also boast outdoor ice skating rinks, a nice change of pace from swooping downhill. And it’s an activity kids and grown-ups alike can enjoy for an hour or two. At Appalachian Ski Mountain, there’s even night skating for pirouettes or hand-holding under the stars. If you’d like to advance your skills beyond awkward stops and starts along the rink wall, Sugar Mountain Resort offers individual or group figure skating lessons. The rink at Beech Mountain Resort lets future Olympians ages four and younger skate for free with an adult. 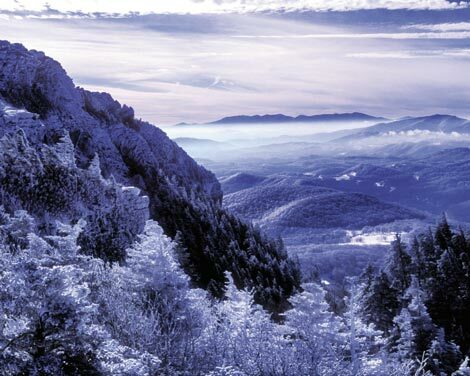 A favorite summertime destination, Grandfather Mountain near Linville takes on a magical air in winter, when the craggy peaks are often shrouded in mist or glistening with frost and snow. Most of the time, the lower paths, including the Profile and Black Rock Nature trails, are passable and positively alive with wildlife, including exquisite displays of native wildflower foliage and many bird species that live in the specialized conditions near 6,000 feet of elevation. Large birds of prey most often appear during spring and fall migrations or in summer, but smaller winged friends such as ruffed grouse, woodpeckers, sapsuckers, and grosbeak species flit about all year. Every plant, rock, and creature on the massive mountain holds a story. For instance, the native galax plant doesn’t just “turn” scarlet in winter, but gets a sunburn after the protective canopy of deciduous foliage has fallen away. There are learning experiences to be had indoors at the nature museum, where an exhibit of North Carolina gems and minerals highlights the area’s mining history. Lifelike models of wildflowers by the late artist Paul Marchand make up for any you might miss along the trails this time of year. The attraction has dubbed the winter months the secret season and offers discounted passes good through April. Adults can get in the whole season with a $32 pass. It’s $18 for children, and a group pass goes for $90. The lively hamlet of Blowing Rock is home to an unusual historic feature just a block from Main Street: a hiking trail through a wonderland dotted with waterfalls. For scenic thrills, head to the Glen Burney Trail. The three-mile round-trip route reportedly originated as a pathway for Native American hunters and later became a logging road. Today the trail is marked and maintained by the town. When you’re inviting hiking companions, keep in mind this is a tough trek in sections, and especially challenging in winter. The path descends through John’s River Gorge and along New Year’s Creek for about a mile-and-a-half, past a series of dramatic cascades before reaching Glen Burney Falls and finally Glen Mary Falls. It’s a steep climb back up the 600-foot vertical rise. The reward at the top is a respite at Six Pence Pub for shepherd’s pie, fish and chips, or beef Guinness, and a pint, of course. High up in tiny Beech Mountain the locals pray for snow, and lots of it. That’s because the parks and recreation department offers free snowshoe tours on a network of public trails. You can bring snowshoes or rent equipment by the hour ($5), half day ($15), or full day ($25) at Buckeye Recreation Center. If you’re new to the sport, private or group guided tours ($30-$70) are the way to find your footing. The cheerful town situated at 5,500 feet is the highest incorporated town east of the Mississippi River, which means glorious views in all directions and crackling cold air. When it’s time to warm up, head to Fred’s General Mercantile for a casual deli meal, say a Reuben or ham and cheese sandwich, and hot chocolate. Before you head back to the lower elevations, wrap up the adventures with dinner at Jackalope’s View restaurant at Archer’s Mountain Inn. Perched here on the slope of Beech Mountain, you’ll enjoy a vista of the winter wonderland you’ve conquered.